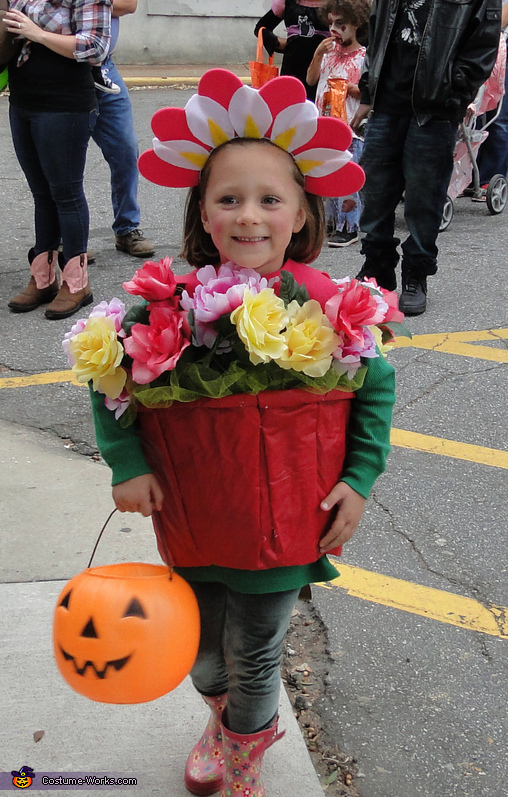 When I asked my four year old, Lanie, what she wanted to be for Halloween she said a "flower in a pot." So, I cut the bottom out of a round clothes basket and recovered it with an old vinyl tablecloth which I secured on the inside with duct tape. Then I taped a variety of fake flowers, leaves and tulle (for fullness) to the inside rim. I made suspenders out of ribbon so she could take the "pot" on and off when she had to get back into the car. I made a headband and collar out of felt to turn her adorable face into the largest flower. She loved it! I loved that it cost less than $15!